Standard Chartered was formed in 1969 through a merger of two banks: The Standard Bank of British South Africa, founded in 1863, and the Chartered Bank of India, Australia and China, founded in 1853. The Chartered Bank opened its first overseas branch in India, at Kolkata, on 12 April 1858. Today the Bank's branches and sub-branches in India are directed and administered from Mumbai. From the early 1990s, Standard Chartered has focused on developing its strong franchises in Asia, Africa and the Middle East. It has concentrated on consumer, corporate and institutional banking and on the provision of treasury services - areas in which the Group had particular strength and expertise. Since 2000 the Bank has achieved several milestones with a number of strategic alliances and acquisitions, which have extended the customer and geographic reach and broadened the product range that Standard Chartered offers. Stanchart believes in building a sustainable business as a bank, simultaneously creating value for its shareholders, supporting its customers and contributing to the communities. Banking is vital to restoring a vibrant global economy. Banks can be powerful contributors to economic and social progress. Stanchart believes that through building a sustainable business it can deliver, broadly, three positive outcomes: contributing to the real economy; promoting sustainable finance; and leading the way in communities. Support for potential solutions to environmental issues is it has committed with the Clinton Global Initiative to facilitate $8 to 10 billion financing of clean and renewable energy projects. 'Seeing is Believing' is StanChart's global collaboration to tackle avoidable blindness across world. It funds leading eye care NGOs to help prevent and treat blindness, with all money going direct to delivering projects on the ground. In seven years, the programme has gone from a simple staff-led initiative to raise enough money to carry out 28,000 cataract operations (representing one operation per member of staff), to a $37 million global funding initiative reaching out to over 30 million people. StanChart has joined forces with five other donors in 2006 to launch 'Nets for Life' and provide one million 'Long-Lasting Insecticide Treated Nets' (LLITN) across 15 African countries. By the end of 2008, 1.5 million nets had been distributed ahead of schedule and under budget. It had committed $5 million in October 2008 to distribute a further five million treated LLITNs by 2013. To date, 600,000 nets have been distributed and 1.2 million people educated on how to use them. StanChart runs a workplace HIV education programme, called 'Living with HIV', since 1999. The programme has been specially developed to provide a minimum standard of HIV education but is flexible enough to be adapted to suit specific needs of local audiences. HIV education is part of global non-disclosure policy on HIV and AIDS, which includes free access to HIV testing and treatment for staff and their dependents. Mr. Agam Gupta was leaving a comfortable life working for a multinational bank till the time he decided to take an 'off' from his job. In August 2009 while working for Standard Chartered bank as head of trading (Global markets), Mr. Gupta told his boss, Mr. Hemant Mishr about his wish to work for and make difference to poor people's life. Soon he started working for an NGO in Mumbai teaching children in municipal schools. Back at Stan Chart this not only surprised everyone but also motivated them to return their share to society. 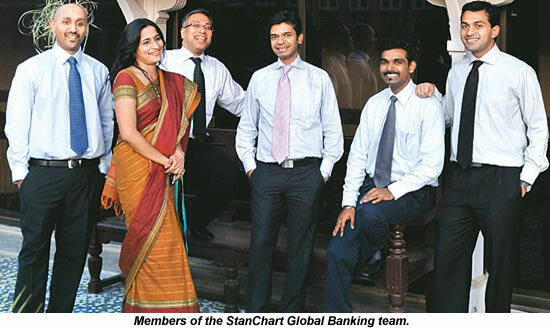 Mr. Mishr, the bank's Managing Director and Head, Global Markets, South Asia, his team of 80+ bankers into an initiative. With an opinion that a collective effort could achieve much more, he put only one item on the agenda-finding a suitable social cause to work for. The aim was to do something tangible for the long term. Thus the 'Burjwadi Project' was born. Burjwadi, about 90 km from Mumbai, is largest one of a cluster of seven hamlets on the foothills of Matheran and has a population of 1,200. It is home to a project where strategic and targeted philanthropy by StanChart has brought transformation to the village - not just in education, but in every sphere of life. The team not only contributed with financial helps or but also actively participated in the field work. Since its inception Team of 14 members has been visiting Burjwadi every fortnight, interacting with elders from villages and actively involving them in the process. The aim is to build a sustainable model touching every aspect of villagers life leading to Social and economical improvement. Each of the villages has a primary school with two classrooms, bare concrete structure. Each class room has around 15 students. The only amnesties classrooms have are sitting strips of faded and frayed mats for students, worn wooden chairs, tables and old steel cupboards in the room for teachers. Classes I and II sit together in one room, while classes III and IV are in the other. The high school, 3-3.5 km away, holds classes V to X. StanChart's employees decided to donate a day's salary to adopt seven primary schools and one high school in the area, beginning with Rs 10 lakh in collections and an equivalent amount from the bank. The team would buy all necessities students needed - textbooks, pencils, pens, teaching aids, school bags and water bottles, from wholesalers at discount and then send it every weekend to Burjwadi. 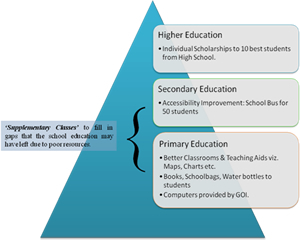 To cope up with high dropout rates at the high school level, StanCharts Team decided to address issues such as cited security especially for girls and the distance students needed to travel to reach the only high school in the region. Since the high school is a good distance away from the villages, most children had to walk an hour to an hour-and-a-half every day just to reach school. To resolve this issue, the StanChart team decided to start a school bus service for around 50 children. To ascertain the scalability of the project the team decided to offer scholarships to 10 of the best students from the high school. The scholarships will fund five years of graduate and post-graduate studies. The strategy behind this is, once these 10 go out and make a future they will come back to help another 10 from these villages and thus create a multiplier effect. The community Centre will house a playschool/Supplementary School, a Library and a Vocational Training Centre. The community centre will also run as a supplementary school for children from Class I to Class X, teaching them maths, English, science and basic computer operations. The supplementary school will fill in gaps that the school education may have left due to poor resources. So far one teacher has been hired; while soon there will be another three more. On the vocational training front, the StanChart team has sponsored 10 boys in their early 20s to train at the local driving school, at Rs 3,000 per trainee. The team has roped in the driving school to help with recruitment. Mumbai's public bus service, BEST, has shown interest in hiring six of them. Apart from that, Burjwadi's women will be trained in making snacks which will later be sold in the open market. StanChart will also donate four computers to Community Centre and has so far invested Rs. 20 Lakhs in construction of Community Centre. Team will soon once again donate one day's salary of each employee to raise additional Rs. 15 - 20 Lakhs which will be further used to carry on expenses of community centre viz. Regular maintenance and teachers' and trainers' salaries.